Other steel goal post manufacturers claim to supply anti vandal lockable goalposts, however these versions only have uprights that lock into ground sockets. Anyone with a basic spanner can undo the nuts & bolts (if not rusted) on the crossbar and remove the crossbar and then the uprights. 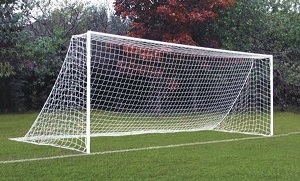 Do not be misled by claims other goalpost manufacturers that they supply secure locking anti vandal goalposts they do not. An additional feature only found on ITSA GOAL steel goalposts are the Industrial nylon push in arrowhead goal net fixings which help protect paint work and extend the life of goal nets. These fixings allow goal post nets to just lift on and off with ease. No tying or clipping is required, which saves hours on match days. Goal post net fixings attached to the uprights have the added advantage of preventing children shimming up the posts and extending the lifetime of the paintwork. External and internal welds are electro plated on the corners of all anti-vandal goalposts to give added protection especially to unseen internal welds. Net supports quickly attach to the crossbar out of the reach on vandals. With no bracket attached to the upright children find climbing onto the crossbar more difficult. The photographs taken around the UK of other manufactures goalpost highlight what the glossy catalogues do not show and indicate the problems found in heavy steel socketed and free standing movable football goal posts . We have never made dangerous heavy free standing steel goalposts and do not recommend that they be used at all.We never put commercial interests before the safety of customers and children. The picture below shows our electro plated steel goal corner and also a few of the problems we have encountered over the years with football goals manufactured by others. rusted bolts allowing posts to be taken out of the ground sockets intact. Low net supports aid climbing and may become detached.